ONE of the most extensive, if not the most extensive, work of this class, in the entire West, occurs on the banks of the Little Miami river, about thirty-five miles north-east from Cincinnati, in Warren county, Ohio. It has not far from four miles of embankment, for the most part very heavy, rising, at the more accessible points, to the height of eighteen and twenty feet. The accompanying map is from a faithful survey, made by Prof. LOCKE, of Cincinnati, and published by him amongst the papers of the American Association of Geologists and Naturalists, in 1843. One or two slight additions have been made to his map, to indicate features which may be of some importance in a consideration of the work and its character. The description of Prof Locke, accompanying the map, though brief, and written with a view to certain geological questions, may not be omitted in this connection. This is a beautiful Lidar image of Fort Ancient as it appears today. Color represents elevation and the earthern walls (berms) have been tinted in blue. In and around the site several mounds can be seen especially on the northern end. "This work occupies a terrace on the left bank of the river, and two hundred and thirty feet above its waters. The place is naturally a strong one, being a peninsula, defended by two ravines, which, originating on the east side near to each other, diverging and sweeping around, enter the Miami, the one above, the other below the work. The Miami itself, with its precipitous bank of two hundred feet, defends the western side. The ravines are occupied by small streams. Quite around this peninsula, on the very verge of the ravines, has been raised an embankment of unusual height and perfection. Meandering around the spurs, and re-entering to pass the heads of the gullies, it is so winding in its course that it required one hundred and ninety-six stations to complete its survey. The whole circuit of the work is between four and five miles. The number of cubic yards of excavation may be approximately estimated at six hundred and twenty-eight thousand eight hundred. The embankment stands in many places twenty feet in perpendicular height; and although composed of a tough, diluvial clay, without stone, except in a few places, its outward slope is from thirty-five to forty-three degrees. This work presents no continuous ditch; but the earth for its construction has been dug from convenient pits, which are still quite deep, or filled with mud and water. Although I brought over a party of a dozen active young engineers, and we had encamped upon the ground to expedite our labors, we were still two days in completing our survey, which, with good instruments, was conducted with all possible accuracy. The work approaches nowhere within many feet of the river; but its embankment is, in several places, carried down into ravines from fifty to one hundred feet deep, and at an angle of thirty degrees, crossing a streamlet at the bottom, which, by showers, must often swell to a powerful torrent. But in all instances the embankment may be traced to within three to eight feet of the stream. Hence it appears, that although these little streams have cut their channels through fifty to one hundred feet of thin, horizontal layers of blue limestone, interstratified with indurated clay marl, not more than three feet of that excavation has been done since the construction of the earthworks. If the first portion of the denudation was not more rapid than the last, a period of at least thirty to fifty thousand years would be required for the present point of its progress. But the quantity of material removed from such a ravine is as the square of its depth, which would render the last part of its denudation much slower, in vertical descent, than the first part. That our streams have not yet reached their ultimate level, a point beyond which they cease to act upon their beds, is evident from the vast quantity of solid material transported annually by our rivers, to be added to the great delta of the Mississippi. Finally, I am astonished to see a work, simply of earth, after braving the storms of thousands of years, still so entire and well marked. Several circumstances have contributed to this. The clay of which it is built is not easily penetrated by water. The bank has been, and is still, mostly covered by a forest of beech trees, which have woven a strong web of their roots over its steep sides; and a fine bed of moss (Polytrichum) serves still further to afford protection." 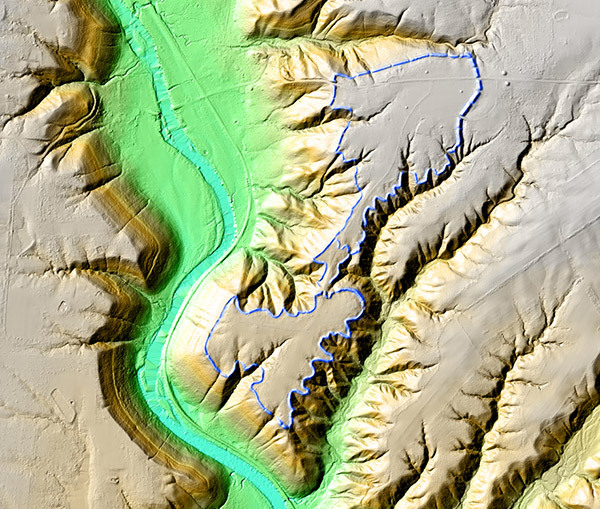 Upon the steep slope of the hill, at the point where it approaches nearest to the river, are distinctly traceable three parallel terraces, which were not represented in the original map, but which are indicated here. It is not impossible that they are natural, and were formed by successive slips or slides of earth, a feature not uncommon at the West. They nevertheless, from their great regularity, appear to be artificial, and are so regarded by most persons. A very fine view of the valley, in both directions, is commanded from them; though, perhaps, no better than may be obtained from the brow of the hill along which the embankment runs. It has been suggested that they were designed as stations, from which to annoy an enemy passing in boats or canoes along the river. This feature is illustrated in the section r s.
From a point near the two large mounds on the neck of the peninsula, start off two parallel walls, which continue for about thirteen hundred and fifty feet, when they diverge suddenly, but soon close around a small mound. As this outwork is in cultivated grounds, it has been so much obliterated as to escape ordinary observation, and is now traceable with difficulty. These parallels are shown in the Supplementary Plan A. They are almost identical, in all their dimensions, with similar parallels attached to ancient works in the Scioto valley. It is a feature no less worthy of remark in this than in other works of the same class, and one which bears directly upon the question of their design, that at all the more accessible points, the defences are of the greatest solidity and strength. Across the isthmus connecting this singular peninsula with the table land, the wall is nearly double the height that it possesses at those points where the con- formation of the ground assisted the builders in securing their position. The average height of the embankment is between nine and ten feet; but, at the place mentioned, it is no less than twenty. At the spur where the State road ascends the hill, and where the declivity is most gentle, the embankment is also increased in height and solidity, being at this time not less than fourteen feet high by sixty feet base. There are over seventy gateways or interruptions in the embankment, at irregular intervals along its line. For reasons heretofore given, it is difficult to believe they were all designed as places of ingress or egress. We can only account for their number, upon the hypothesis that they are places once occupied by block-houses or bastions composed of timber, and which have long since decayed. These openings appear to have been originally about ten or fifteen feet in width. This work, it will be seen, consists of two grand divisions, the passage between which is long and narrow. Across this neck is carried a wall of the ordinary dimensions, as if to prevent the further progress of an enemy, in the event of either of the principal divisions being carried,—a feature which, while it goes to establish the military origin of the work, at the same time evinces the skill and foresight of the builders. 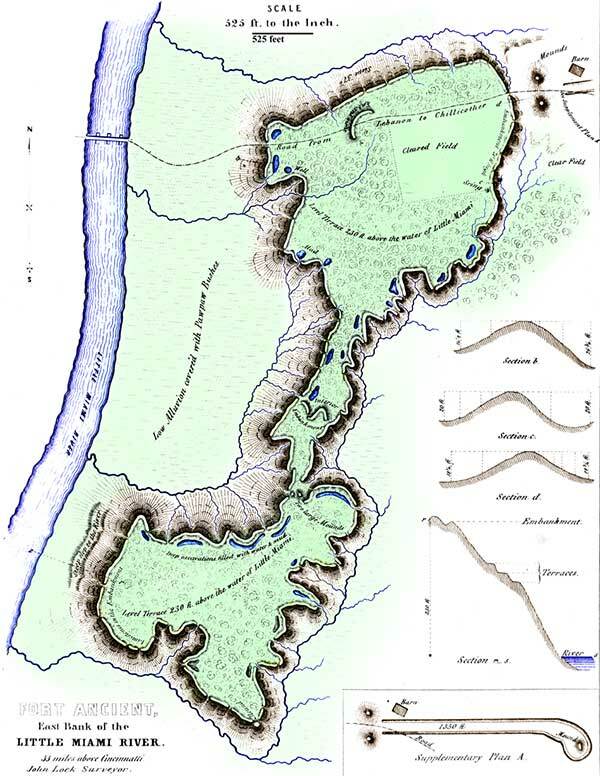 This foresight is further shown, in so managing the excavations necessary for the erection of the walls, as to form numerous large reservoirs; sufficient, in connection with the springs originating within the work, to supply with water any population which might here make a final stand before an invader. Even in the absence of these sources, surrounded as the work is on every hand by streams, it would be easy, in face of the most formidable investment, to procure an adequate supply. At numerous points in the line of embankment, and where from position they would yield the most effective support, are found large quantities of stones. These are water-worn, and seem, for the most part, to have been taken from the river. If so, an incredible amount of labor has been expended in transporting them to the places which they now occupy,—especially will it appear incredible, when We reflect that all of them were doubtless transported by human hands. A review of this magnificent monument cannot fail to impress us with admiration of the skill which selected, and the industry which secured this position. Under a military system, such as we feel warranted in ascribing to the people by whom this work was constructed, it must have been impregnable. In every point of view, it is certainly one of the most interesting remains of antiquity which the continent affords. 16. An account of this work, accompanied by a very good plan, appeared in the "Portfolio," (a periodical published in Philadelphia,) for the year 1809. Both plan and description were copied by Mr. Atwater, in his memoir, in the first volume of the "Archaeologia Americana." It was also briefly described by Dr. Drake, in the chapter on Antiquities contained in his "View of Cincinnati." Since that period, it has been the object of frequent visit and remark.